For a listing of previous Retail Watch stories, please see our Retail Watch Archive. BLUE CHEESE — Both cow’s milk and sheep and cow’s mixed milk Blues are an important part of Willapa Hills Cheese’s artisan line up. Next year, the company will be introducing its first hard cheeses. ARTISAN NORTHWEST PRODUCER — Stephen Hueffed and Amy Turnbull left busy careers in the city to raise their children and make cheese on a farm nestled on the banks of Washington’s Chehalis River. DOTY, Wash. — A couple of years ago in Manzanita, a small Oregon coastal town, a young college-aged intern busily shared samples of a Washington company’s artisan cheese spreads during an eclectic evening farmers’ market filled with consumers who had hurried to the coastal reprieve to escape the hustle and bustle of city life. This scene repeated itself weekly — with up to 14 farmers’ markets at a time — as Willapa Hills Cheese, a small farmstead and artisan cheese company nestled on the banks of Washington’s Chehalis River, introduced many consumers to its cheeses. Interns, company employees and occasionally Willapa Hills owners Stephen Hueffed and Amy Turnbull themselves would travel throughout the Northwest in an effort to get the word out about their sheep’s milk, cow’s milk and blended milk cheeses. Bacon Blu, a cream-cheese based spread, was always a hit at these markets, but others were popular too — including Blu, Cranberry Blu, Red Pepper, Honey Chipotle and Garlic Herb spreads as well as cow’s milk and mixed milk Blues. It wasn’t easy — and profitability varied — but it was an important part of the company’s marketing plan to introduce its product and get consumer feedback. Today, as more and more retailers carry its cheeses, farmers’ markets have taken a back seat in Willapa Hills Cheese’s marketing plans. Now the company is concentrating on working through brokers and distributors to get its cheeses into retailers and restaurants throughout the Northwest and beyond. The company, home to 140 milking ewes and also the purchaser of fresh cow’s milk from a local dairy, is entering new markets all of the time. Originally only found at farmers’ markets and in high-end retailers and restaurants, Willapa Hills’ products now are carried in the specialty retail deli cases of mainstream retailers throughout the West Coast, including Murray’s Cheese Kiosks in Washington, Oregon and California, and Kroger-owned Fred Meyer and QFC stores throughout the Northwest. Most recently, Willapa Hills Cheese filled its first order for Costco, and it is in the final process of having its products considered by Whole Foods Market, an early supporter of Willapa Hills products, for its national list of approved cheeses. Willapa Hills Cheese also is finalizing two new cheeses — Lilly Pad and Ewe Old Cow — it is introducing in 2015. Getting Willapa Hills Cheese to where it is today — with production high enough to sustain a growing customer base — has been a steep learning curve that has occasionally resulted in changes in direction, Stephen Hueffed says. Hueffed and his wife Amy Turnbull made the conscious decision to get into the cheese business about a decade ago when they were first starting their family. Working in the frenetic busyness of the Seattle area — he in nonprofit management and she as a naturopathic physician — they were becoming increasingly dissatisfied with corporate structures, insurance regulations and commutes. This dissatisfaction eventually led them to discuss in earnest whether their combined skill sets and passions could be turned into a family business and a different way of life for their young family. “We both liked artisan cheese and were idealistic and at the same time pragmatic. We explored three or four possible paths forward, but ultimately settled on cheese. There’s a certain energy around cheesemaking,” Hueffed says. That dream began to take concrete form when the couple purchased a historic farmstead near Chehalis, Wash., in 2005. With Hueffed still commuting 100 miles each way to the Seattle area, the couple then took the next step by establishing their foundation flock of 60 dairy ewes with the help of Dream Valley Farm in Strum, Wis. In 2007, a milking parlor was completed and licensed. In 2008, Willapa Hills’ cheese plant was approved as a Washington state dairy processor and, on the Fourth of July, the company crafted its first batch of cheese under its newly minted license. Willapa Hills Cheese started initially with just sheep’s milk cheese, including Willapa White, a fresh lactic-style sheep’s milk cheese, and Fresh with Ewe, a fresh lactic cheese sprayed with Blue mold. The years since have seen a flurry of activity as the couple re-visioned their product line as they learned more about production and distribution in the midst of what was also a challenging economy. Fresh with Ewe, for instance, they ultimately decided to discontinue because it was too fragile. They also soon realized that in order to produce enough product for the business to be sustainable, they would need to add cow’s milk products as well. “It’s really hard to make the math work with just sheep’s milk,” Hueffed says, noting that it takes 24 ewes to produce as much milk as one cow (or 12 ewes to one cow in terms of actual cheese yield). As a result, Willapa Hills Cheese began working with a local family dairy. Yet despite the occasional changes in direction, Hueffed and Turnbull were firm on the overall direction of the business. “Through it all we have kept our eyes on the goal of creating quality natural artisanal cheese and dairy products on a family farm,” Hueffed says. What has become one of Willapa Hills Cheese’s most popular items began almost by accident. The company was making some blue mold cheeses that tasted great but had too much moisture and were ripening too fast, Hueffed says. The cream cheese-based spreads became the company’s home for too moist or over-ripe Blue cheese and soon became its most versatile product. As the spread line developed, the company began using its premium Blues in the product as well as adding multiple flavors other than Blue to the line in order to address consumers’ diverse flavor desires. “The spreads are a bridge,” Hueffed says, noting that they open the door for consumers and retailers to try the company’s other cheeses. In 2011, the couple realized that if Willapa Hills Cheese was going to be a financially sustainable business for the long term, they would need to up their game once again. With the help of Brian Howard, broker with Madison Lane Sales + Marketing, they identified three priorities: increase production, aging and staging capacity; enhance product stability and shelf life through modified atmospheric packaging (MAP); and respond to unmet demand in existing and new markets. The first two priorities were addressed through two funding sources. Willapa Hills received a Whole Foods Market Local Producer Loan in order to purchase a piston filling machine and a MAP cupping machine. This dramatically increased efficiency and doubled product shelf life, effectively making Willapa Hills a viable source of cheese for larger retailers. Thanks to the MAP cupping machine, the company’s cheese spreads now have a 45-day shelf life. Willapa Hills also engaged Slow Money NW in order to secure funding for a new vat and related production equipment. Through Slow Money, a local investor, also a farmer, funded the purchase of a used 600-gallon vat from Ohio, significantly increasing production efficiency and capacity of its aged cheeses. “We’re notching up our business and working to become a significant regional producer,” Hueffed says. The third priority of responding to unmet demand in existing and new markets is now in process. For the last few years, the company has offered Big Boy Blue, a natural rind Blue cheese made with cow’s milk that also is an American Cheese Society award winner. The company also makes Two-Faced Blue, a sheep and cow’s mixed milk cheese similar to a mountain Gorgonzola. Willapa Hills also introduced Pluvius, an aged cow’s milk table cheese. While the company started out focusing on Blue cheese, it found many people who don’t like it. Pluvius — named after the Greek god of rain and an appropriate name for a cheese made on a dairy where it rains more than 70 inches a year ­— was created to bridge the gap. Essentially Big Boy Blue without the blue, the semi-soft aged cheese is now made in 5-pound wheels. These include Washington stores PCC Natural Markets, Town & Country/Central Market, Metropolitan Market and Oregon’s Market of Choice and New Seasons in addition to Whole Foods and other stores throughout the Northwest. Willapa Hills now is in the process of bringing its first hard cheeses to market. While both are originals to the marketplace, they find their inspiration in other hard cheese. The first, Lilly Pad, is inspired by Gruyere and is a cow’s milk cheese made in a 15-pound barrel. It will be launched in January 2015. Ewe Old Cow, also made in a 15-pound barrel, is a mixed milk cheese inspired by Pecorino Romano and is expected to be launched in August 2015. Hueffed says these cheeses are key to the company’s growth. As Willapa Hills Cheese prepares to launch its new products, it also continues to market its product through a number of grassroots efforts. The company boasts an in-depth website where cheese can be purchased, and its Facebook presence is growing. The company also operates a farm store, open daily, and offers a variety of “farm immersions” for groups from three to 30 or more. Each immersion is customized to meet the needs of the particular group with participants spending significant blocks of time immersed in one or more aspects of the creamery or farm’s production. 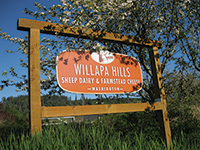 In addition, Willapa Hills Cheese currently is collaborating with another local sheep dairy and a regional cheese producer in an effort to establish a larger flock of ewes on one operation to maximize returns. The effort, still in its planning stages, has the power to result in significant economies of scale and quality milk production, Hueffed says, which would allow all three companies to further expand production of sheep and mixed milk cheeses.